We are not offering personal stays at this time. Personal silent stays (also called ‘personal retreats’) are a wonderful support for well being. To drop the concerns and obligations of frantic thinking and completely allow yourself to just be is rare in this world. Time away from the busyness of day-to-day life is a gift to the heart and mind. With this allowance to just be, That which inspires and Loves you can now reach you. The Monastery is a beautiful backdrop for quiet contemplation and deep silence. Its purpose is to support you as you let go and rest your mind. We offer personal retreats of a minimum of two nights up to one month. Living in silence with the supportive energy of those who are living in a continuous state of devotion is unique and healing. The peaceful, natural backdrop of the canyon setting illuminates the mind that is open to receive this healing power. Personal retreats are silent, unstructured, and undirected. Suzanne Sullivan shares the deep invitation into Presence. We welcome you into this place of simplicity, and support you prayerfully and mindfully. 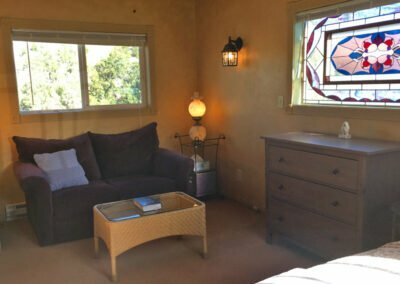 We have comfortable private rooms with a small fridge, electric tea kettle, and lovely balconies to enjoy the natural beauty that surrounds you. We have 200 sq. ft. dome rooms that are perched on a dramatic 200 ft rock cliff overlooking the valley and river. For those on a budget, we have two dorm-style rooms (one for men and one for women) with comfortable bunkbeds. 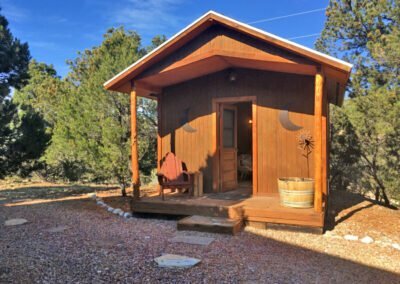 For those looking for a place to give their full attention to a creative project such as art, poetry, music, or writing, we have the perfect retreat cabin. A cozy, fully self-contained cabin near the river. $1,800.00 per month (single occupancy, $2,450.00 for double occupancy) – you would be responsible for your own meals. If you prefer to bring your tent we have a campground with full bathhouse with a lovely soaking tub for your use. $35.00 per night – you would be responsible for your own meals. Discounts are available for stays longer than ten days. A beautiful sitting room for silent meditation and or reading. Our library has an ample selection of contemporary spiritual classics. Miles of unspoiled nature for contemplative walks. Spiritual counseling is available at an additional cost of $50.00 per session. Though some private rooms include a private toilet and sink, most of our accommodations do not. We offer a lovely, shared bathhouse with private toilet and shower rooms, and there are clean, well-maintained outhouses around the property. The Monastery buildings and grounds are not equipped for those in wheelchairs. Individual retreatants must be at least eighteen years of age. No children or pets are allowed unless agreed upon with us in advance. Once you have booked your stay with us, we will send you a map with detailed directions if you are driving in. If you are arriving by plane you would fly into Salt Lake City International Airport (SLC). From there, you can either rent a car, hire a taxi, or request from us a Monastery shuttle pick up. We are a two hours drive east of the airport. The cost for a Monastery shuttle ride to or from the airport is $100.00 each way. On your date of arrival, you can check in anytime after 3pm. It is requested that you arrive before sundown, so that we can give you a proper orientation and tour of the grounds. You will be given a Release of Liability waiver to sign, and some additional guidelines regarding the property. Silence fosters the experience of communion with Spirit, and is a fundamental part of the monastic experience here. During your personal retreat, we ask you please minimize your speaking unless it is absolutely necessary. Meals are prepared by resident volunteers and lovingly served to the retreatants. The kitchen cannot provide meals for those requiring special diets. You may bring along your own foods and beverages if needed. All buildings and common areas are smoke-free. Alcohol and recreational drugs are not permitted anywhere on the Monastery grounds. The nearest small town is Duchesne, Utah, approximately eighteen miles east of the Monastery. If you feel drawn to spend some time at the Living Miracles Monastery, please write to us through our contact page here.